CRESLI offers guided walks led by naturalists with years of experience, and can give information as well as practical advice for the safety of both seals and seal watchers. “Due to the potential for serious disturbance to the seals from people who are not knowledgeable about how to observe seals without disturbing them, I strongly recommend that one attend a guided trip,” said Dr. Kopelman, a veteran seal walk guide. CRESLI offers seal walks at multiple convenient times on Saturdays and Sundays, and seal watchers can make reservations for seal walks at the CRESLI website here. Watch for signs that the seals feel harassed, such as increased vocalizations by the seals, one or more seals heading back into the water, one or more seals having their eyes on you, or any disturbance from their normal resting positions. Stay at least 50 yards away from resting seals so that they can have time to relax, as repeated interaction and disturbance can tire them out, thus putting them at greater risk of being caught by a predator. If mothers with pups are disturbed, the mothers may abandon their pups, which could lead to the pup dying. Stay on the upper part of the beach or bluffs, and away from the water’s edge to give seals proper space while remaining quiet and calm. Never get in the water with seals or attempt to feed them. If seals are spotted from a boat, maintain a distance of at least 200 yards in order to avoid disturbing them. Limit your viewing time to a maximum of 30 minutes. Where do Seals Prefer to Haul-Out on Long Island? Though Dr. Kopelman told us that researchers are still unsure what determines where seals will be, they do know that the “prime haul-out areas tend to be calm areas in bays and coves near inlets,” so that seals have easy access to oceans for feeding. Most haul-out sites are far away from human activities so that seals are not disturbed, so to view seals, seal watchers can expect to take a bit of a hike before reaching an area that is out of the way to see seals at rest. 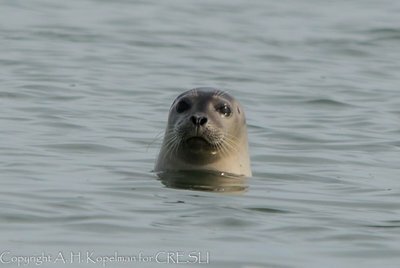 Many of the seals that can be seen have been in the waters around Long Island since September and stay through May, before returning to the Gulf of Maine, the Sub-Arctic, and the High Arctic for the Summer. Do not worry if you miss the seals – they will be back in the fall, and CRESLI will be hosting additional marine life programming until then. Their offshore whale watch season will begin in late April with a 46 hour trip to Hydrographers Canyon that will take explorers 140 miles from Montauk to the edge of the Continental Shelf to find sperm whales, as well as other whales and marine creatures. Local whale watch trips from Montauk will begin June 29, which last six hours and are only scheduled for Sundays. Viewers on these local trips have been able to see fin hales, humpback whales, minke whales, common dolphins, a variety of sea turtle species, and thousands of pelagic birds. Photos courtesy of Dr. Arthur Kopelman. Subject: LongIsland.com - Your Name sent you Article details of "An End-of-the-Season Guide to Seal Watching on Long Island"